A site that currently contains a giant hole in the ground, once meant to serve as the foundation of a super-skyscraper called the Chicago Spire, may soon house two new towers. 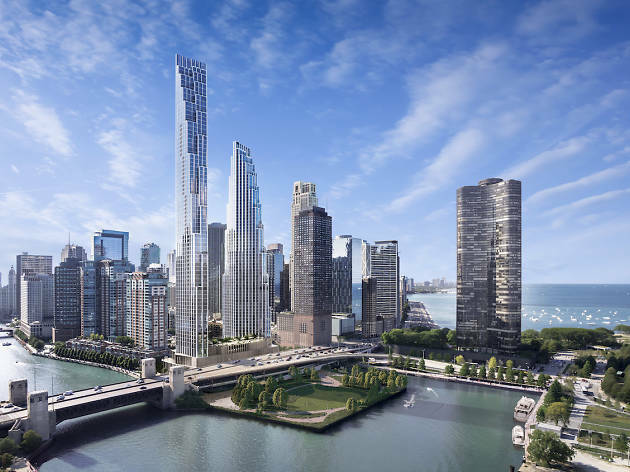 Last night, developers Related Midwest unveiled their plans for a pair of buildings that could sprout up from the property at 400 North Lake Shore Drive, placing two new silhouettes in the constantly-shifting Chicago skyline. 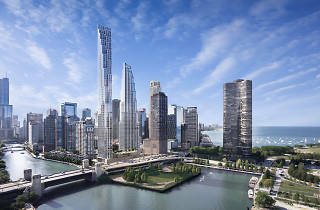 While the Chicago Spire was designed to be the tallest building in the city at 2,000 feet high, the two towers proposed to occupy the former project's footprint are significantly smaller. The taller of the two towers will top out at 1,100 feet and the second will be 850 feet tall. Both will showcase a cascading tiered design (inspired by the rippling waters of Lake Michigan) that will allow for the construction of multiple outdoor terraces on each building. Crain's reports that the project could cost as much as $1 billion when all is said and done. According to the developers, the buildings will contain condos, apartments and a boutique hotel, connected by a four-story building that houses amenities for residents and visitors. The development will also include a landscaped extension of the Riverwalk that passes under Lake Shore Drive, giving pedestrians a new way to access the lakefront and the soon-to-be-rehabilitated DuSable Park. As with any major construction project, don't expect the two lakefront towers to spring up anytime soon. Once the city signs off on the project, the developers estimate that it will take four-and-a-half years to complete (which likely accounts for the time it will take to fill in that giant hole in the gound). Check out some additional renderings of the proposed skyscrapers below.